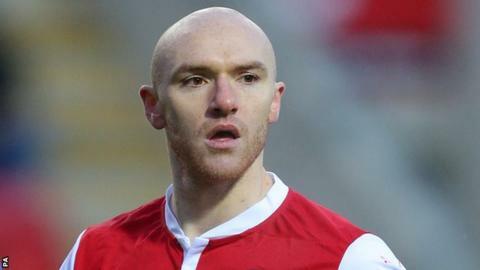 Conor Sammon scored against his former club to help Rotherham to a surprise win over promotion hopefuls Ipswich. The striker, who spent the first half of the season on loan at Portman Road, lashed home from close range after the visitors failed to clear a corner. Matt Derbyshire's earlier header put the Millers ahead as he stooped at the far post following a defensive lapse. Rotherham goalkeeper Adam Collin made several saves, including a fingertip stop from Luke Chambers' header. The three points for Steve Evans's men was just their second victory at the New York Stadium since mid-October, while Ipswich have now won once in their last six league games and drop to fifth in the table. Daryl Murphy, the Championship's leading scorer with 18 goals, spurned a glorious opportunity to put the visitors ahead after just 16 seconds when he burst into the box after outmuscling Millers captain Craig Morgan, but his weak effort was saved easily by the legs of Collin. After such a bright opening, the game quietened down before the hosts opened the scoring through former Olympiacos forward Derbyshire. Ben Pringle's deep free-kick evaded every Ipswich player, Morgan flicked the ball on and it found its way to Derbyshire, who bravely dived in to nod home. Before the Millers' back-to-back home wins against Ipswich and Bolton Wanderers, Rotherham had not won in front of their own supporters since the 2-1 victory over Leeds on 17 October. The visitors began the second half brightly and almost equalised when Cole Skuse's pin-point free-kick found the head of Chambers, but his powerful header was superbly tipped over by Collin. Shortly after Murphy's header was cleared off the line by Zeki Fryers, the hosts went down the other end and doubled their advantage through Derby loanee Sammon. Pringle's corner was not cleared by the Tractor Boys' defence, the ball broke to Sammon and he lashed it past Polish keeper Bartosz Bialkowski. The second goal seemed to deflate Mick McCarthy's side as they pushed forward but failed to create any clear-cut opportunities before Millers substitute Jordan Bowery almost made it 3-0 in stoppage time, when he raced through on goal but his attempt was kept out by Bialkowski. "I think it was a wonderful performance, full of all the things that we're good at. We were good on the ball, good in possession and there was fantastic industry from everyone in a Millers shirt. "We have beaten an excellent side. They should probably have been one up in a minute. We took 15 minutes to settle ourselves down. We had to grind it out. My players deserve enormous credit. "I think Conor Sammon does a lot of things in the game that perhaps not everyone sees. His willingness to work hard really is an asset." "I thought Rotherham played well. The game is going nowhere and they score from the free-kick which was poor marking from us and not like us. There was nothing special or strange about the deliveries - we should have dealt with them better. "When we conceded the second goal it was actually after our best spell. We've had chances but if we defend like that then it will cost us. "I might have to look at freshening it up with the players I've got and keep going." Match ends, Rotherham United 2, Ipswich Town 0. Second Half ends, Rotherham United 2, Ipswich Town 0. Corner, Rotherham United. Conceded by Bartosz Bialkowski. Attempt saved. Jordan Bowery (Rotherham United) right footed shot from the left side of the box is saved in the centre of the goal. Assisted by Richard Smallwood. Teddy Bishop (Ipswich Town) wins a free kick on the right wing. Foul by Richard Smallwood (Rotherham United). Substitution, Rotherham United. Adam Hammill replaces Conor Newton. Offside, Ipswich Town. Tyrone Mings tries a through ball, but Noel Hunt is caught offside. Substitution, Rotherham United. Jordan Bowery replaces Matt Derbyshire. Attempt missed. Danny Ward (Rotherham United) right footed shot from outside the box misses to the left. Assisted by Frazer Richardson. Attempt blocked. Freddie Sears (Ipswich Town) right footed shot from the centre of the box is blocked. Assisted by Noel Hunt. Luke Chambers (Ipswich Town) wins a free kick in the defensive half. Foul by Danny Ward (Rotherham United). Offside, Ipswich Town. Luke Chambers tries a through ball, but Noel Hunt is caught offside. Attempt missed. Freddie Sears (Ipswich Town) right footed shot from outside the box is high and wide to the right. Assisted by Tyrone Mings. Attempt missed. Ben Pringle (Rotherham United) left footed shot from outside the box is too high. Assisted by Danny Ward. Christophe Berra (Ipswich Town) wins a free kick in the defensive half. Foul by Matt Derbyshire (Rotherham United). Foul by Noel Hunt (Ipswich Town). Ezekiel Fryers (Rotherham United) wins a free kick in the defensive half. Noel Hunt (Ipswich Town) wins a free kick on the right wing. Foul by Kári Arnason (Rotherham United). Substitution, Rotherham United. Danny Ward replaces Conor Sammon. Substitution, Ipswich Town. Noel Hunt replaces David McGoldrick. Attempt blocked. Paul Green (Rotherham United) right footed shot from the right side of the box is blocked. Assisted by Ben Pringle with a cross. Attempt saved. Daryl Murphy (Ipswich Town) right footed shot from very close range is saved in the centre of the goal. Corner, Ipswich Town. Conceded by Paul Green. Goal! Rotherham United 2, Ipswich Town 0. Conor Sammon (Rotherham United) right footed shot from the centre of the box to the centre of the goal. Assisted by Conor Newton following a corner. Matt Derbyshire (Rotherham United) wins a free kick in the defensive half. Attempt blocked. Teddy Bishop (Ipswich Town) left footed shot from the right side of the box is blocked. Attempt blocked. Daryl Murphy (Ipswich Town) left footed shot from the left side of the box is blocked. Assisted by Tyrone Mings. Attempt blocked. Daryl Murphy (Ipswich Town) header from the centre of the box is blocked. Assisted by Teddy Bishop with a cross. Corner, Ipswich Town. Conceded by Kári Arnason. Attempt blocked. Freddie Sears (Ipswich Town) right footed shot from outside the box is blocked. Assisted by Tyrone Mings. Attempt missed. Tyrone Mings (Ipswich Town) left footed shot from more than 35 yards misses to the right. Hand ball by David McGoldrick (Ipswich Town).